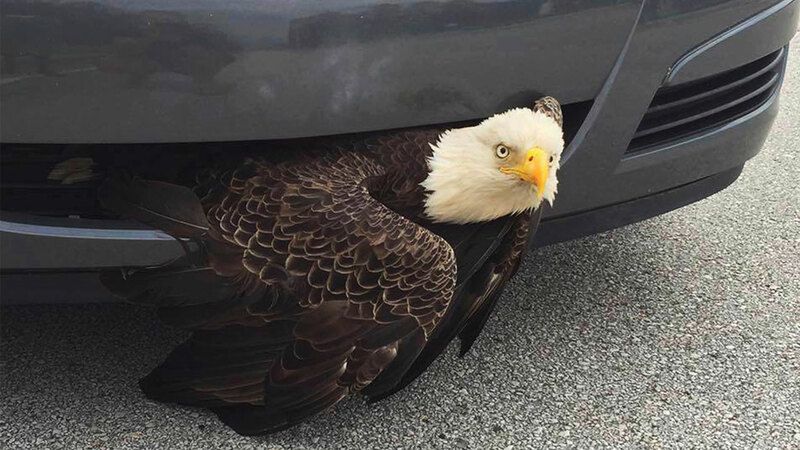 GREEN COVE SPRINGS, FL -- A bald eagle that somehow managed to get wedged in the front grill of a car was freed unharmed after a passing motorist noticed the bird. The Clay County Sheriff's Office says a resident of the Fleming Island area south of Jacksonville noticed the bird peering out of a passing car Saturday as the area recovered from Hurricane Matthew. The resident urged the motorist to pull over and rescue crews were called. The sheriff's department says rescue personnel and deputies were able to work the bird free from the car. It was taken to a wildlife sanctuary in Jacksonville but authorities say the eagle appears to be unharmed. Photos posted of the eagle on the sheriff's office Facebook page show it standing on two feet in a cage.